With a good bike leash for dogs, your pup will enjoy while you cycling. Here are five Highest Rated Bike Attachment for dogs that will keep you and your dog active and safe. Do you like cycling together with your dog? This kind of activity has become very popular as of late, and for a reason – it’s healthy and fun. The best time to engage in it is in the early fall, which is right there on our doorsteps. Unfortunately, not all dogs are the same. Some of them just don’t want to keep up with their owners during these cycling sessions, as they’re too energetic or just don’t care. Luckily, there’s a solution for these kinds of issues, and that’s the purchase of one of the currently most popular dog bike leashes. Using a bike dog leash is a fantastic way to do some cycling together with your medium-sized or large breed (for small pups, the basket is a better solution). This thing is attached to the owner’s bike, so you won’t have to hold the leash in your hand anymore and risk both yours and everybody else’s safety. Another way to go on a bike ride with your pup is using dog bike trailer. You can use them for any sized dog but have in mind that they won’t get much exercise that way. On the other hand, if you love jogging you can get one of our recommended strollers for dogs and bring your puppy along. In the following articles and reviews, we’ll briefly discuss some safety considerations of cycling with dogs, and also review some of the best models that are currently on the market. Read on, and find an ergonomic and dog-friendly model that will make your rides a pleasant experience! With the 5-star approval from the American Pet Association and hundreds of positive user reviews, the Bike Tow Leash is a product that we simply had to test out. It features a pretty unique design, as well as some characteristics that make it stand out from other similar products. Let’s check it out! Hand-assembled and designed by the guy who was once an aircraft parts engineer, the product looks incredibly durable and sturdy. It offers an outstanding stability and a pull resistance, even for the owners of large breeds. It sports a unique mast design that’s very flexible and allows the user to communicate turns with his pet – and this certainly deserves some special praise. When it comes to installation, the potential buyers have nothing to worry about. It’s quickly attached to the bike’s rear wheel without the need to use any tools. The right-side installation is also possible on some models of bicycles if they sport the right configuration. While using this leash, the user is able to continuously monitor how the dog is doing and if he needs to stop. The greatest thing here is that there’s absolutely no way for the pet to bump into the wheels. The canine also can’t get in front of the bicycle, which lowers the chance of an accident even more. 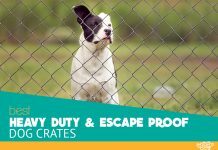 This product is best for the pups that have 25 pounds of weight or higher, no matter if they’re light or extreme pullers. Also, the manufacturer advises combining the product with a comfortable, padded harness, as it will put less stress on the pet’s throat area. And we encourage you to check if the product fits your bike, just to be sure. Although it is not perfect, we can see why this leash has received so many positive user reviews. Its unusual design and the solid construction make it stand out from the competition – in our opinion; it’s totally worth the money. The Walky Dog Plus is used by thousands of active pet owners all around the world, as it is highly functional and also quite affordable. Let’s give it a more in-depth look! As you can already guess, the purpose of this device is to allow the owner to safely take his pooch with him on the rides. It’s a new revision of the old Walky, and this improved version can be installed in minutes and is very easy to use. The model is manufactured from high-quality materials, and, in our opinion, looks very sturdy and durable. The primary material used here is the high-carbon stainless steel, with the military grade 550-pound pull strength. As far as we’re concerned, this is very impressive, especially when combined with the fact that is rot and UV fade resistant. Once it is installed, it will allow your pet to run freely along your bicycle, with no risk of bumping into the pedals or wheels. It can be fitted on virtually any bike in a matter of minutes. There’s a simple clamp that you can attach to your bike without damaging its frame. The same could be said for the removal – there’s no need for a permanent fixture with this model. Another feature that we really liked about this product is that it’s very lightweight, allowing the user to take it off the bicycle and use it as a regular leash. There’s also the so-called “Quick Lock and Release” feature that makes switching between the bikes a breeze. Of course, the reasonable price is just another great perk of the Walky Dog Plus. The low cost of this product is definitely its best characteristic – you won’t have to give too much money to own a quality bike leads for dogs. However, it also sports some handy features that make it model worth considering for purchase no matter its price. Next up is Bike Balance’s attempt to create an ideal solution for all those active dog owners who like cycling. The Dog Jogger Kit brings an attractive look, sturdy construction, and a design that makes maneuvering a piece of cake. Let’s see if it’s worth the money! One of the first things to notice about this product is its construction. The whole thing looks very sturdy, as it was manufactured from stainless, aircraft-strength aluminum. As far as we’re concerned, we don’t think that this thing will break anytime soon. The thing that separates this product from the competition is its unique design. Unlike some other models we’ve reviewed, this one is mounted on the rear of the bike, giving the dog freedom to run both beside and behind your bicycle. However, this means that this cannot be mounted on bikes with disc brakes or rear suspension. The so-called “no-tangle bungee strap system” is there to pamper your pooch while still exercising full control. Fortunately, the Dog Jogger is easily adjusted to accommodate almost all breeds, and that’s a big plus in our book. The fact that the pet can follow you behind the bicycle deserves commendation, as it lowers the risk of injuries that can occur with your furry friend running beside you. Our only complaint here is the assembly. The diagrams and directions are a bit confusing, and some users might have a hard time to figure out which part goes were. However, once you assemble the leash, you’ll immediately realize how secure this whole system is. Another great thing is that it doesn’t take too long for the dog to get used to it. As you can see, our only complaint about this dog bike attachments is how difficult can it be to put it together. But once the user figures out how to do that, all that’s left to do is to enjoy safe and secure rides with his beloved pet. According to tons of user reviews, many pet owners were quite thrilled by the Springer Dog Exerciser, as it presents the best way to give an overly-energetic dog an exercise that he needs. That is exactly why we decided to put our hands on it – read on and find out everything about it! Essentially, the Springer Exerciser is a combination of a rigid arm that keeps the pet away from the bike, a clamp for attaching, and a steel-made spring that’s supposed to absorb sudden pulls. The whole device was manufactured from heavy-duty steel and looks absolutely durable. This sturdy design is guaranteed to have the device serve you for the years to come. The mechanism of this model allows the dog owner to control the bicycle with both hands while still providing a safe way for the pup to run alongside him. There’s a pull pin that attaches the model’s arm to the clamp, as well as the release mechanism that lets the rider quickly release the pooch if the need arises. It will work on most bicycles, but the manufacturer also offers adapters for those with unique bikes. During our testing period, we have noticed that this device works best with pets wearing a wide-strapped harness. If you attach it to a pet wearing a collar, you will be risking an injury to the dog’s throat or neck. We would suggest using any kind of padding between the pup’s skin and the harness, as that will prevent bruising and scraping. Another thing we liked is the presence of three fastening positions for the cord. The position which you’re going to use should depend on your dog’s strength, as well as on your weight as the rider. In conclusion, we think that the Springer Exerciser is among the best bicycle dog leash we’ve reviewed so far. It’s an innovative device with lots of useful features, and one worth considering for purchase. 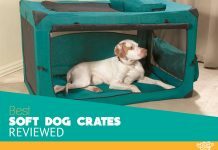 PetEgo is an Italian manufacturer of pet-related equipment, known for the beauty of their products that are designed by Emanuele Bianchi, who is a professional designer and the head of this company. That’s exactly why we’re excited to test their new product, which promotes safety while exercising with your pooch. Let’s do it! Just like with all other products of this company, the design that this leash sport is flawless. Although the looks aren’t really the most important thing here, we simply have to say that this is the best-looking product of this kind on the market. If the looks are important to you, the PetEgo Cycleash is certainly the best choice. It has been designed to be attached to the round bike seat posts, and its double-connection clamp (made out of zinc alloy) can hold two leash poles at one time. This is very convenient when it comes to switching sides, as it doesn’t disturb the already installed clamp. Since it uses the TPR technology, this model will efficiently absorb all kinds of shocks and disturbances, providing the dog owner with a smooth bicycle ride. We liked the presence of the clip holder and EVA grips, as they provide a pretty secure control while one is guiding or walking the pet. When it comes to installation, the PetEgo Cycleash is one of the best leashes on the market. Attaching and removing this model can be done by literally anyone, even by those who know next to nothing about these things. But the greatest feature is price – it’s the most affordable model we’ve reviewed so far and an excellent choice for those with lower budgets. Of course, this comes with a price, and that’s the lower-quality build. Many of our readers report that the clamp is the first to give, as it needs constant tightening. This affordable model is one of the best-designed dog leashes for a bike we’ve seen so far, and as such is absolutely worth considering for purchase. It’s not flawless – but its good sides overshadow the disadvantages with ease. This is a must – visit your local vet to find out if your pooch is fit for the biking. Your pet might have some underlying conditions that you don’t know about, and the only person who can find them is the veterinarian. Don’t bike with dogs under one year of age or 25 pounds of weight. Make sure to take a helmet and something that will make you noticeable to other people on the road, like a reflective device or bright clothes. Bring some water, a tire pump, a spare tube, as well as your identification, cellphone, and some money. If possible, the harness you’re going to use should be padded, and not very long, so that the pet can’t get too far away from you. Another thing to take care of would be the dog’s visibility. It’s important that you buy him a reflective vest, or at least a collar with blinking lights. Once you take care of these things, you and Fido will be ready for the epic journey! People often pedal their bicycles without thinking if the dog can keep up. This is where the size of your pup matters the most. Always remember that the small breeds have to run at their maximum capacity to keep up and that they just can’t comfortably maintain this speed. Whenever you stop for a meal, always give one to your pet too, and the same goes for water. Your dog has been working just as hard to get there and certainly needs refreshment. Always bring some extra snacks and water when you’re biking with your pooch. If you’re going to be biking on rough terrain, make sure to take care of your pet’s feet first. You can purchase specialized little boots that will protect his paws from injuries. Of course, some breeds have tougher paws and don’t need any protection. If the temperature is above 80 degrees (26°C), you should skip biking with your furry friend. Don’t forget that your four-legged companion is covered with fur that will warm him quicker than you. If you absolutely have to do it, do it in the morning or the evening. 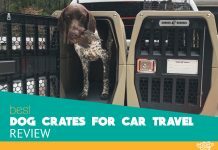 With these tips, you and your dog’s journeys will be much safer. Good luck! In our opinion, the dog bike leashes are among the most useful pet-related equipment that the money can buy today. They make biking with your beloved Fido a lot more convenient and easier, and also prevent all sorts of dangerous situations from occurring. A quality dog cycle attachment will keep the pet close to you, but still won’t let him bump into your wheels and get a serious injury. Furthermore, the constant pulling and twitching that the pets do during the biking could take you down from the bike, and we don’t even have to say how bad that can end up. But with one of these devices, something like that just can’t happen – both of your hands will be on the handlebar, and you’ll be riding with a peace of mind. In our reviews and articles, we have tried to discuss how to safely use the bicycle dog leash and to show you which models are currently best on the market. We went over all of their characteristics, advantages, and flaws, and tried to see which ones of them are actually worth the money. We did that in a straightforward, professional, and unbiased way, and we hope we’ve been helpful. If we had to select just one model as our favorite, that would be the Bike Tow Leash. This device comes with a unique design that’s guaranteed to make every journey a joyful experience and has an excellent build and design. In short words, it is the product of our choice. I had been doing research on these for awhile. One thing I needed to ask most of the manufacturers was if their leashes could handle two dogs. I found most do not, but that the bike tow leash and the springer can handle two dogs up to 150 lbs in total weight on both. Springer also told me they have a new bracket that can handle two arms at the same time on one bike. They suggested that for people with two large breeds like Great Danes. Unfortunately the way the bike tow leash is made, most bikes cannot do two arms. So for 2 dogs over 150 lbs total is a no go for that one. Ultimately, I went with a newer brand leash similar in design to the bike tow except the leash is behind the tire. My puppies like to try to touch my legs. This one wont let them past the rear axel.